Microsoft Dynamics ERP and CRM coursework adds marketable skills to any resume. credit can complete any of the following courses. Two Course Microsoft Student Certificate Program (Choose any two (3) credit courses). Course credit is available from accredited accounting/information systems and business university and can be transferred to your institution. Courses are compliant with CPA course requirements and can be used for coursework in 120 hour or 150 accounting or CPA preparatory curriculum. Request a transfer course credit packet for information for your college or university. Students can enroll in Undergraduate and graduate coursework to gain additional exposure to Dynamics 365. 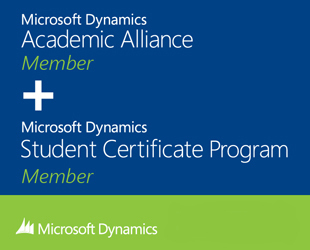 CPA/Accounting students – Earn an undergraduate or graduate certificate in Dynamics 365 and apply credits toward your 120 or 150 credit hour requirements for the CPA exam.